.45 GAP ammunition is a powerful round that has its roots in proven ballistic performance and offers something more to those who want a truly optimized modern cartridge based on the proven hardball round of the .45 ACP. 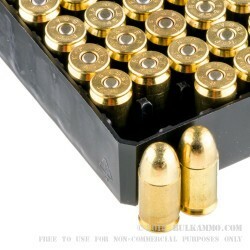 It offers the same power and velocity as the .45 ACP, while offering a shorter case that is more resilient. 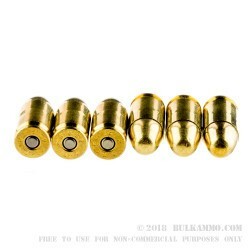 For the shooter that wants .45 ACP performance in a smaller grip size and in a gun that can function on the same length as the 9mm cartridge roughly, can find a good round in the .45GAP. 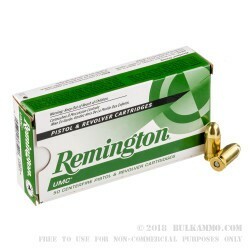 The Remington company and UMC merged in 1912, way before the .45 GAP was conceived but the fact remains, that UMC’s business practices and production methodologies have created an environment in which a round like the .45 GAP could thrive; where a cartridge can be made for a reasonable price with a great performance and for people who want good reliable experiences. That’s what Remington UMC line is all about: producing memorable, enjoyable shooting experiences, regardless of the ammo choice. This is such an ammo to allow for that type of experience. The 880 fps velocity and 395 ft. lbs. of energy offer a mild round compared to others. 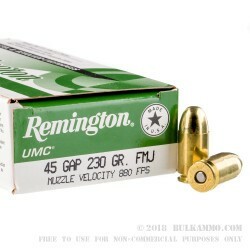 Q: Do you plan on having more variety of 45 GAP ammo in the future? Thank you! A: Our buying is driven by market demand. We feel that our 45 GAP selection reflects the current demand for this caliber. Q: What is the difference between ACP and GAP ammo? Why is there a difference? A: .45 ACP or .45 Auto is a cartridge that dates back over 100 years and has been fired through many pistols, submachineguns, carbines, revolvers, and even rifles. Because of its size, pistols chambered for this cartridge often have large frames, which can be difficult for those with smaller hands to hold or fire .45 GAP (Glock Automatic Pistol) was created by the Glock pistol company in an effort to allow pistols with the frame dimensions of a 9mm or .40 caliber handgun to fire a .45" diameter projectile. Because of chambering differences, it is not safe to interchange .45 Auto and .45 GAP ammunition. A: .45 ACP ammo is over 100 years old. It is a fairly large cartridge and requires a frame designed for its size. .45 GAP has been around for less than 10 years. It is designed to be shot from a 9mm/.40 S&W frame, so although the bullet diameter is still .45", the overall length is shorter than that of .45 ACP. The two are not interchangeable.